Keep your elderly loved one safe and well fed! If your family has reached the point where you have disabled the more dangerous appliances in your elderly loved one's kitchen, you are not alone. If you have ever secretly shut off a kitchen gas line or snipped and taped some electrical wires to ensure your elderly loved one's safety, don't worry; many families wind up at a conundrum of a crossroads. If the probability of your elderly loved one safely navigating cooking is panic inducing yet the thought of your senior dining out daily makes your wallet cry and your purse strings seize up, don't distress! There are a variety of viable alternatives to source that can keep your elderly loved one safe and well fed. Yes, you can get almost everything delivered these days! Many grocery stores are jumping on board this trend of grocery delivery. This has been around for decades in larger metropolitan areas such as New York and Los Angeles but has recently expanded to other large metropolitan areas and even smaller communities. Perhaps your local grocery store participates in this service; if not call and ask if they would make this service available. Even if this request cannot be organized at the store level there are home health providers that offer this service from the aide taking care of the entire grocery trip to escorted transportation if your elderly loved one still enjoys a trip around the store. Don't overlook hiring somebody strictly for grocery delivery! This is the perfect job for an older high schooler or college student. In addition to hiring, source your local senior resources (senior center, health department) to see if any community service organizations offer this service gratis. Grocery delivery is a great opportunity for your senior to get premade meals, microwavable meals, as well as other easily assembled meal options that don't require the use of the stove or oven. Never underestimate the comforting appeal of a warm meal. A meal that is easily able to be cooked and/or reheated in the microwave is a good way to balance your elderly loved one's desire for a warm meal and your peace of mind that they won't engage an appliance other than the microwave. From store bought, individual microwaveable meals to freshly made meals packaged in convenient, single serve portions microwaveable meals are not only convenient but can be as nutritious as desired. Microwavable options are available for every meal and every dietary desire including (but not limited to) vegetarian, low calorie, high protein, dairy free, and flavors from across the globe! If family is too far extended in their commitments to join Grandma for meals or too far flung in location to personally stock the fridge with easily reheated, palatable, microwavable meals put your available resources to work! Engaging in multiple meal services is a good way to ensure that Grandma is well fed and that her fridge is well supplied with fresh meals. There is an added bonus of keeping a variety of visitors knocking at the door to socially stimulate Grandma, as well as serving as a welfare/safety check. Meal delivery services such as "Meals on Wheels" and other similar social programs abound. Inquire with your local health department to see if they have community meal delivery programs that your senior can use in conjunction with "Meals on Wheels". Check for a Meals on Wheels program near you. In addition to "Meals on Wheels" and similar community meal delivery programs, there are also a wide variety of commercial enterprise (for profit) meal delivery programs. Meals from a single supplier delivered to your elderly loved one's door on a regular scheduled basis and ordering from your typical neighborhood eatery that offers delivery are two common options. In some areas there are services where your senior would be able to order from a variety of places offering take out (but not delivery) and have it conveniently delivered to their door. Companies such as UberEats and GrubHub along with local "food taxis" act as a food porter or meal sherpa for your elderly loved one. Don't forget that most home health providers have a variety of services to cover Grandma's needs from meal prep, to errands (including meal take out), and escorted shopping trips where they can either purchase ready-made and/or microwavable meals or gather the ingredients to assemble their own meals if they are so inclined. Certain programs are funded with the stipulation that they supply senior participants with meals. In addition to state and local funding of meal programs the USDA has programs specifically for Adult Day Care seniors. If your elderly loved one is in a program that doesn't offer meals, check to see if they are in fact eligible for this invaluable service. Meals are not only about food and nutrition. There is a social aspect to meal time that inherently quenches the human desire for social interaction. Dining with a partner or in a group setting fosters positive social interactions, enhances social bonds, and offers an encouraging option to those more inclined to solitude. 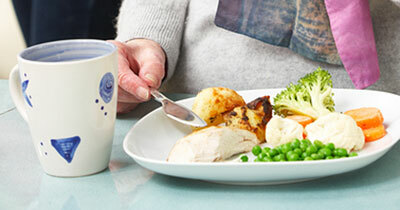 While meal delivery is a wonderful service and a well-stocked freezer with efficient microwave are welcome additions to any senior household, never underestimate the need for companionable mealtime conversation. Leah Felderman is a proud alumnus of University of Central Florida (BA) and San Diego State University (MA). She has worn many occupational hats including teaching, hospitality management, government contractor and non-profit organizer. She is an intrepid international traveler having visited over 60 countries before happily settling down into her new life chapter of domesticity as a mom and Coast Guard wife.